Indianapolis has a team for every sports fan and a fan for every sport. We are sports nuts and love our home teams!. From an NFL franchise to division 1 rugby, Indianapolis is home to numerous athletic teams and sporting events. Indy is known as the Amateur Sports Capitol of the World and is home to the Greatest Spectactle in Racing, the Indianapolis 500, but all will find plenty to rave about here. The Colts are the NFL's team of the decade. Basketball has a long standing tradition and provides fans with plenty of excitement, from the NBA's Pacers and the WNBA's Fever to great college and high school basketball. In addition to The 500, racing fans also have NASCAR's Brickyard 400, Moto GP, as well as drag racing and more at O'Reilly Raceway Park. The AAA Indianapolis Indians are a hometown favorite with one of the best ballparks in the country. Hockey fans can root for the Indianapolis Ice. There are also plenty of golf, fishing, and outdoor activities. 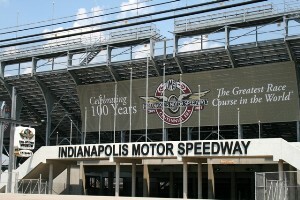 Perhaps the most iconic speedway among racing enthusiasts is the Indianapolis Motor Speedway, the course of the Indy 500 and Brickyard 400. Since 1909, this track has captivated millions and set the standard in motorsports excellence. The Colts moved to Indianapolis in 1984. Their home field, Lucas Oil Stadium, is one of three with a retractable roof. Unlike the others, however, Lucas Oil Stadium is the first that opens and closes from sideline to sideline, and has the first moving window in the NFL. In the team’s 57-year history, the NFL franchise has won four world championships and 18 conference or divisional titles. The Indiana Pacers formed in 1967 as part of the American Basketball Association (ABA), winning three championships. In 1976, they merged with the National Basketball Association. The Pacers play home games at Conseco Fieldhouse, which they share which their WNBA counterpart, the Indiana Fever. The sister team to the Indiana Pacers, the Indiana Fever has been part of the WNBA since 2000. The team has won a conference championship and calls Conseco Fieldhouse home. Since 1902, the Indianapolis Indians have played baseball in our great city. The team is currently the Triple-A Affiliate of the Pittsburgh Pirates, playing home games at Victory Field. The Ice, part of the United States Hockey League, were established in 2004 and play at Pepsi Coliseum/Conseco Fieldhouse. The team has a USHL championship under its belt, as well. In 2002, the Indiana Speed, part of the Women’s Football Alliance, was established. Since then, the team has won several division championships. The Indianapolis Impalas are a Division 1 American rugby team founded in 1980.